The major significance of the German naturalist-physician Johann Friedrich Blumenbach (1752–1840) as a topic of historical study is the fact that he was one of the first anthropologists to investigate humankind as part of natural history. Moreover, Blumenbach was, and continues to be, a central figure in debates about race and racism. How exactly did Blumenbach define race and races? What were his scientific criteria? And which cultural values did he bring to bear on his scheme? Little historical work has been done on Blumenbach’s fundamental, influential race work. From his own time till today, several different pronouncements have been made by either followers or opponents, some accusing Blumenbach of being the fountainhead of scientific racism. By contrast, across early nineteenth-century Europe, not least in France, Blumenbach was lionized as an anti-racist whose work supported the unity of humankind and the abolition of slavery. 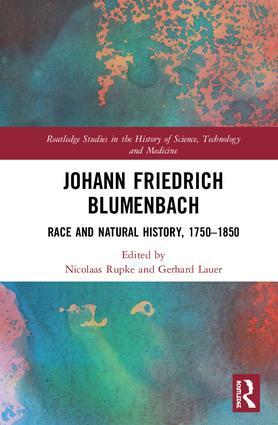 This collection of essays considers how, with Blumenbach and those around him, the study of natural history and, by extension, that of science came to dominate the Western discourse of race. Nicolaas Rupke is Professor Emeritus of the History of Science at the University of Göttingen, Germany, and Rupert H. Johnson Jr. Professor at Washington and Lee University, USA. Gerhard Lauer is Professor of Digital Humanities at the University of Basel, Switzerland, and the current director of the Blumenbach – Online project.